PNB had in February said it had been defrauded by jewellers Nirav Modi and Mehul Choksi. New Delhi: State-run Punjab National Bank (PNB), which reported a $2-billion fraud in February, on Tuesday declared a June quarter loss of ₹ 940 crore, against a profit of ₹ 343 crore a year ago. Recovery of non-performing assets, cost-cutting measures including shuttering international and domestic branches and better loan margins helped the bank improve on its March quarter performance, where it had reported a record loss of ₹ 13,417 crore. PNB is still recovering from the fraud when jewellers Nirav Modi and Mehul Choksi borrowed against letters of undertaking fraudulently obtained from one of its branches in Mumbai. In the June quarter, gross non-performing assets (NPAs) were at 18.26% against 13.66% in the year-ago period and 18.38% in the preceding quarter. Net NPAs were 10.58% against 8.67% in the year-ago quarter and 11.24% in the preceding quarter. Provisioning for NPAs was at ₹ 4,982 crore as against ₹ 2,560 crore in the year-ago period and ₹ 16,203 crore in the preceding quarter. The June quarter provisions were made partly to cover losses on account of the fraud ( ₹ 1,863 crore) and to improve its provision coverage ratio, PNB said. Net interest margin, a key measure of profitability, improved to 2.9% from 2.56% in the year-ago period. Net interest income was up 21.7% to ₹ 4,692 crore. “The bank has been prompt in taking corrective measures. PNB has done introspection and looked at ways to ensure that systems are strengthened," PNB managing director and chief executive officer Sunil Mehta said at a press conference. 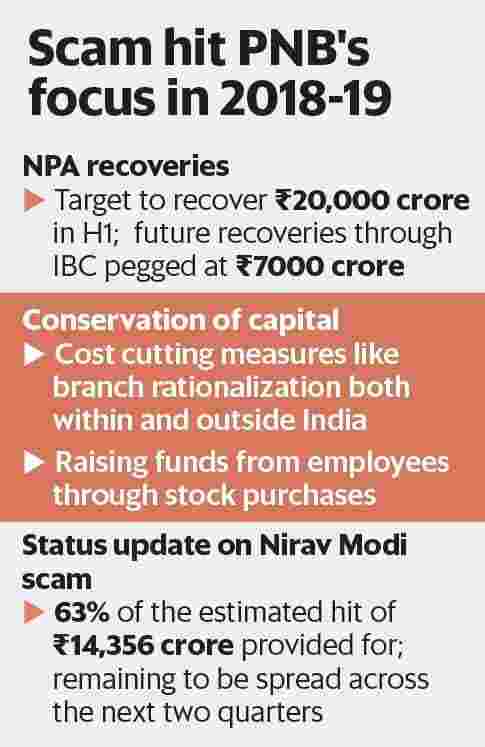 Going ahead, the focus will be on NPA recovery and conservation of capital, Mehta said. Mehta said PNB recovered ₹ 8,445 crore in the June quarter against ₹ 5,617 crore in all of 2017-18, adding the target is to recover ₹ 20,000 crore in the first half of 2018-19. In the June quarter, the bank recovered ₹ 3,200 crore through the Bhushan Steel and Electrosteel insolvency resolutions. The bank’s capital adequacy ratio as of June end was 9.62% against 11.64% in the corresponding period a year ago and 9.2% as of March end. The common equity ratio also improved to 6.05% from 5.96%. If one takes into account the ₹ 2,816 crore infused by the government in July, PNB’s capital adequacy ratio has improved to 10.3%. The bank has also sought approval from the RBI and the government for raising funds from employees through stock purchases up to ₹ 10 crore. The bank raised ₹ 167 crore through the sale of non-core assets in the first quarter.